In other news: my drawing of nightgaunts has been reprinted in Grame Phillips’ Lovecraftian zine, Cyaegha! Cyaegha is a full-on printed zine of Lovecraftian fiction & art, available from Grame Phillips at (name of zine)@live.co.uk. You can find more info on the website. Prices per issue incl. P&P (in UK Pounds): 4.50 (UK), 5.50 (Europe), 6.50 (ROW). It’s a very classy magazine with lots of poetry & prose and an interesting biographical piece on a feud Lovecraft had in his amateur journalism days, “Gidlow vs. Lovecraft,” by the inestimable Kenneth W. Faig, Jr. Faig’s piece even has new factoids about the co-author of “Poetry and the Gods” — which to me as a Lovecraftian bio-completist is like ***OMFG****!!!!!! I haven’t read the rest of the issue yet, but please go to the website, order one and check it out! Amazing work, as always. 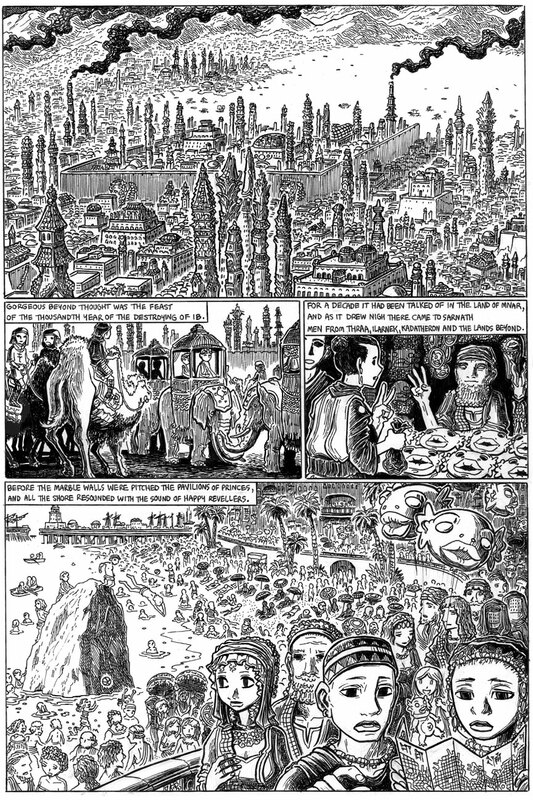 This story is kinda difficult to imagine with the same kind of zeal as Lovecraft’s more daring projects, but your illustrations really bring the locales of Sarnath to life. Thanks for sharing with us! One creature HPL created that I have not seen depicted anywhere is called “uhrag” and very little is spoken of about them beyond being black and they hang from cave ceilings. I have it as a dangerous predator that can drop down and enrap you in its muscular skin folds gibbering as it eats you alive. Very hard to kill. Better to run when one strikes. Who knows how many more are hanging from the cave ceiling or branches of trees. I’ve found it interesting you draw the people of IB as fishes (I thought they were the weird moon-beasts) and amusing that you’ve decided to have balloons!